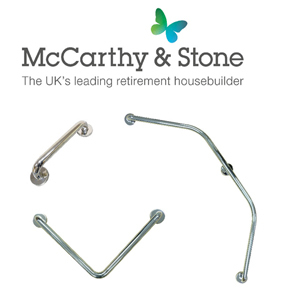 Byretech are proud to be suppliers of Grab Rails to the McCarthy & Stone group. We specifically designed a range of Grab Rails and Shower Curtain Rails all in stainless steel that have been installed in many of their retirement residences throughout the UK. These items are approved by McCarthy & Stone for use in their builds. From Straight Grab Rails to L Shape and the designer Double Cranked grab rail we make them all. Plus they come beautifully polished and complete with fixings. If you require contract pricing for these items please call 01527 522 522 and ask for our contracts department.